Péago is your guide on the French toll roads and offers clear directions. Choose which features you wish to enable for a pleasant journey. Péago will keep you informed on your home screen. The clever guidance adapts to your chosen route. We will help you find cheaper gas stations just off of the toll road. 1. What can I do with Péago? Péago helps you on your journey through France by making the trip more pleasant and cheaper, using a smart algorithm. We do this buy offering you guidance on all toll gates on the toll road. If you purchase the feature 'saving', you can reduce the amount of toll fare you'll have to pay. This reduction is roughly between 10% and 25%. You can reduce the amount of toll you'll have to pay by paying more often. Péago helps you by letting you know when you'll have to pay, and how much you'll have to pay. 2. What is a péago? A péago is way to save money on French toll roads by paying more often, at various exits. By not paying at once at the last barrier, you'll save up to 25% on toll fare. 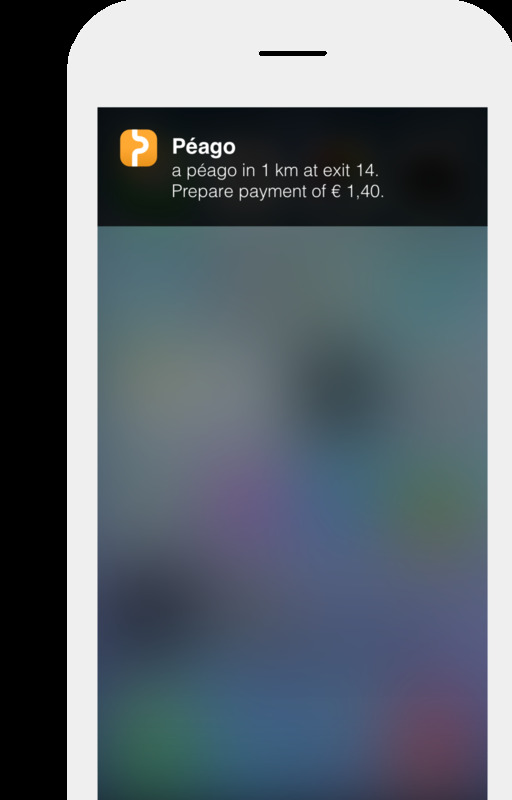 Péago tells you when and where you have to pay, and how you can continue your journey by guiding you back on the toll road. Péago will only advise quick and easy péago's – for example, an exit which is directly followed by a roundabout. This way, you can save money on toll fare without avoiding the toll roads. 3. Do I need an internet connection to use Péago? No, internet is not necessary for the use of Péago. Even when you're offline, Péago is able to help you save on toll costs in France. Internet is solely necessary for downloading Péago, or for downloading tariffs (e.g. when starting Péago for the first time). When you’re online you’re able to type in a specific address in France. When you're offline, you must choose a (semi-)big city in France. When only passing through France, it’s best to choose the last city you’ve passed; this way Péago is able to give you optimal results. TIP: It’s possible to save the address of your destination ahead of time. This enables you to save your chosen destination (with internet) in Péago and reuse this afterwards (without internet). 4. Does Péago replace my navigation system? No, Péago fully supports your route, given the destination you’ve provided ahead of time; This support is possible with or without a navigation system. It’s even possible to use Péago alongside your navigation system on your smartphone. And should your destination change along the way, Péago will change along with it. Before as well as during a péago you will be guided; this way you’ll always be driving in the right direction and have a worry-free way of saving on toll costs. 5. How does it work in terms of saving? The French toll network is a complicated system. Each piece of toll way has a different rate. It can often be cheaper to pay a couple of times during your route (rather than the total amount at the end of the route). It’s one hundred percent legal to save money this way and just a clever way to not have to pay the maximum price for your trip through France. Péago tells you exactly how and when you can do this and directs you on all the expenses you make on the toll ways. With Péago you save quickly and easily on toll costs. 6. Do I have to pay again to be able to save on toll? You will not have to purchase the in-app savings option, if you already owned Péago. Contact us if Péago does ask for an additional payment. You can contact us at info@getpeago.com. 7. How can I contact Péago? Péago is available for questions, complaints and compliments on info@getpeago.com. + How does Péago know how much toll I have to pay? Rates for toll ways are open to everyone. Péago makes use of this information. Péago knows the price of all possible connections and therefore delivers the best options for you. Péago chooses only those savings that are really worthwhile in relation to your trip. 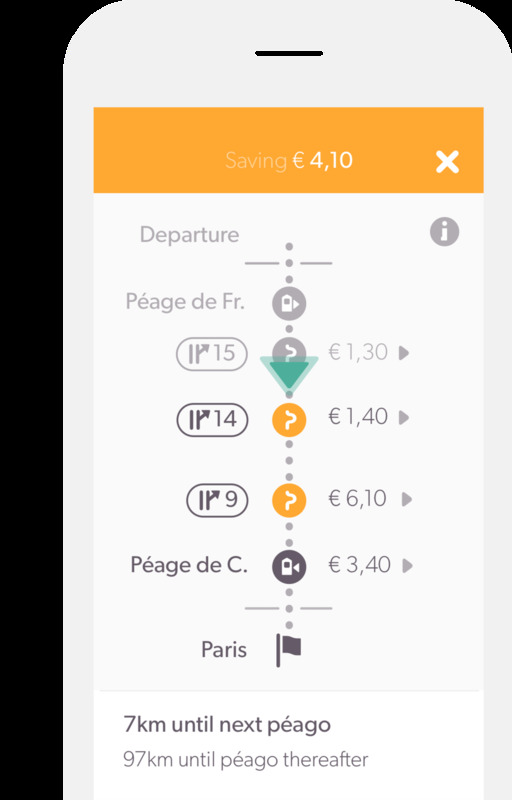 So Péago helps you to save money in a convenient way during your trip in France. + Does Péago also work alongside transponders for automatic toll payment? Yes! Automatic toll payment is very handy to have while making use of toll ways in France because it saves time at the tollgate. With a transponder you will save the exact same amount of money, but you’re also able to save time while carrying out a péago. Péago will tell you exactly how much you’ll be paying at each tollgate. This way you’ll not only be saving money, but you’ll also know how much you’re paying on toll. How convenient! + How much can I save? How much you save all depends on the vehicle category and the route that you decide to take. There are more than 40.000 routes in France and they all have a different rate. It is just not feasible to provide the savings per class for all routes. What we do know is that for example by driving to Paris from Calais you can earn your investment back in full. On a long route through France your savings will most likely be more than 10 euro’s. When driving a camper or caravan your savings will be even more. Everything you’ll save after, is money in your pocket! + How to use Péago? Choose your destination. As long as you’re driving through France, Péago will search for a way to save on toll expenses. It’s customary to use your current location as a starting point, but you’re able to type in something else. Then, choose the category of your vehicle. Péago will then determine the total expenses you would’ve otherwise paid on toll, and how much you’ll save. On the screen you’ll be able to see where you’ll need to leave the toll road and where you’ll be able to continue your route. After this you’ll be able to begin your trip and as soon as you’ve passed the first tollgate Péago will be your guide. As you near the tollgate, Péago will instruct you. At the end of your journey Péago will once again display the amount you’ve saved on toll expenses. + What is my vehicle category? The toll companies in France have rules which will determine this for you. When using Péago you can also easily see which category your vehicle is. Péago will then go on to determine the best way to save with your specific vehicle. Therefore, make sure you choose the right one. This way Péago can make sure you save optimally on toll expenses. + Can I re-use my destination? Yes. In Péago you’re able to save your destination. This way you’re easily able to re-use this information and save every time you go to that particular destination. + What’s the meaning of “doing a péago” exactly? You take the exit from the toll road. You provide the toll ticket and then you pay what is needed. You take a turn after the toll gate you’ve just passed (most often via a roundabout). You receive a new toll ticket. You proceed with your journey on the toll road. Péago will advise you at all times, making your journey as pleasant as possible with as much savings as possible. + Does Péago determine my route? No, Péago doesn’t navigate on its own. You determine the route that Péago must take. You’re in the lead and Péago, your traveling partner, dances alongside you. Péago estimates beforehand how you will drive and what your savings will be. But in the end it’s you who determines the exact route and Péago will adapt to the changes to make sure you save as much as possible. + Do I have to avoid the toll road? No. Péago helps you save on the high toll costs in France without avoiding the toll road. But Péago is not a navigation application. You’ll just pay at the right gates, and continue your journey on the toll road. That way, you’ll be saving money without extending your journey. With Péago, you’ll get the advantage of saving money, but also the advantage of traveling quickly and comfortably on the French toll roads. + Do I have to keep my phone on the charger? We recommend you keep your phone on the charger during the trip. Péago guides you by using location data. Requesting this data requires a lot of battery power. + Does Péago work while other applications are active? Yes! Péago keeps running in the background and continues to guide you during your journey through France. Using notifications you’ll be informed about the actions you’ll have to take on the toll road. That way, you’re not only saving on toll, but you’ll also be well prepared, even if Péago is not the active application on your phone, or if your phone is on standby. + How do I download Péago? It's now possible to download a free version of the application. This free version will guide you on the toll roads, and will inform you of the amount of money you'll have to pay. You can download the application in the Apple App Store or the Google Play Store. After starting the application, you can purchase the feature 'saving'. + How much does the Saving feature cost? The feature 'saving' costs £2.99. Thanks to Péago you’ll be saving money on your trip to France. That's how Péago makes your journey more pleasant and helps you save money. In both stores, you can pay using the usual method with a creditcard. It's also possible to pay with gift cards for either iTunes or Google Play. You can also usually buy Visa Credit Cards at the grocery store, gas stations and book stores. There is always a method to purchase the saving feature, and save money in France. + What about other languages? Péago is available in English, French, Dutch, Flemish, German and Spanish. We’ll add more languages as soon as possible. + Is Péago also available for Windows Phone? Not yet; this is a work in progress. Follow us on Twitter (@peago_uk) or Facebook (peagoUK) and stay up to date. We’re doing all we can to make sure that Window Phone-users will also be able to use Péago in the near future. + Does Péago require a subscription? No. You don’t need a subscription to use Péago. + Is saving money using Péago legal? Yes. The toll network in France is a complicated network. Every piece of toll way has a different rate. For this reason it’s often cheaper to pay at various tollgates along the way. This is totally legal and simply a way to avoid paying the full price on toll in France. Péago can tell you exactly where and when you should pay toll so that you’ll easily be able to save on toll expenses in France. + Is doing a péago safe? Péago only makes use of péago’s that are safe and easy to use and it’ll give you all the information ahead of time. It’s possible that some circumstances (e.g. roadworks) require a change in course. Always follow the local road signs and use your common sense. It’s nice to save on toll costs but safety always comes first. Péago has consideration for safety first while trying to help you save on the French tollways. + Are there any issues concerning Privacy? + Are the toll rates up-to-date? Péago makes use of the rates in 2017. If, by chance, you encounter a different rate please let us know: tarrifs@getpeago.com. Send a picture of your receipt so that we can investigate this and, if we’ve made a mistake, compensate you. + How will Péago effect my travel time? On average péago will add 2 minutes to your travel time. Péago enables you to save on toll but, considering the fact that you don’t have to avoid tollways, it also saves you precious time you’d lose by leaving the tollways altogether. + What about extra fuel costs? Always an easy way to turn around (usually via a roundabout). Extra distance is almost never more than 1 kilometer (0.6 miles). + What if there is a traffic diversion? Roadwork is unavoidable, also in France. If you happen to encounter road works then Péago will respond cleverly. If you have to leave the tollway then Péago will take up the guidance as soon as you approach a tollgate again. A traffic diversion will therefore not withhold you from saving opportunities. + Do I have to follow the route Péago advises? No, Péago doesn’t navigate itself. It’s up to you to determine the route, and Péago adapts to this route. Look at it this way: you lead and Péago dances alongside you. Péago is your ‘dance partner’, your travel partner. When necessary Péago will recalculate the best way for you to save money in France. + What if my destination isn’t France? No problem. You’re able to choose a destination in France and beyond. As long as you’re traveling through France Péago will search for ways you can save on toll expenses.